The Volkswagen Polo is only two years younger than the Golf, yet it took 19 years for Volkswagen to finally determine that its city car would be a good fit for the sporty GTI badge. In between the first Golf GTI of 1976 and the original Polo GTI of 1995, the German brand believed its Passat family sedan and wedge-shaped Scirocco coupe were worthier recipients of the famous trio of capital letters (though there was a supercharged Polo G40 in 1991). The ‘sixth generation’ Polo GTI released this year, then, is technically a fourth-generation model – and only the third to reach Australia since 2005. So, it’s a relative newbie, and certainly lacking the heritage of its bigger brother. It’s slowly closing the size gap, though. With the latest Polo breaching four metres in length, it’s almost as big as a 2003 Mark 4 Golf. 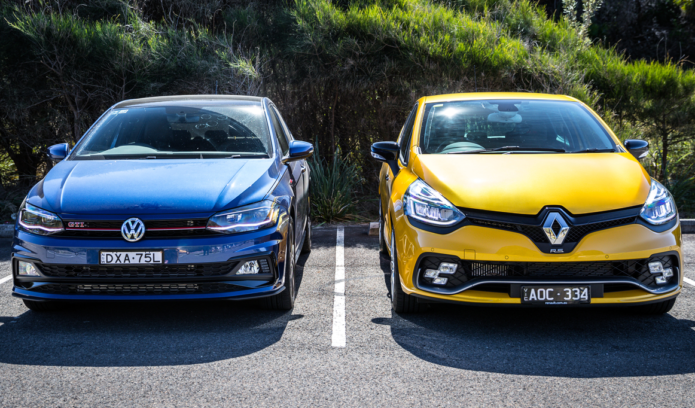 The Renault Sport Clio’s history in Australia isn’t much longer than the Polo GTI’s 13 years – not helped by the French brand’s local struggles before the turn of the century. But after we missed out on the first hot Clio – the 1993 Clio Williams – the Clio RS172 (badged just Renault Sport Clio here) formed part of Renault’s (umpteenth) Australian relaunch in 2001. It proved to be a huge hit with enthusiasts – and relatively more successful than the regular Clio – and was followed by the upgraded RS182 and next-generation RS197/RS200 models before the latest Clio RS lobbed in 2014. In 2017, the sporty Clio was given a midlife update to give it some semblance of freshness against newer rivals. And with the next Ford Fiesta ST not due until early 2019, the French hottie is the perfect litmus test for a Polo GTI that hitherto hasn’t managed to discover the all-round magic of its iconic sibling. The price of the Volkswagen Polo GTI has matured along with its dimensions. It has previously been a sub-$30,000 proposition even with an auto, though the new model starts from $30,990. Standard equipment again includes a dual-setting suspension (introduced as standard in 2016 on the previous GTI), plus inclusions such as 17-inch alloy wheels, tartan cloth seats, dual-zone climate control, keyless entry/start, rain-sensing wipers, leather steering wheel with paddleshift levers, LED interior lighting, tyre pressure monitoring, 8.0-inch infotainment touchscreen, smartphone mirroring, LED tail-lights and autonomous emergency braking. Pricing is identical for the repetitiously named Renault Clio RS Sport (in full that’s Renault Clio Renault Sport Sport!). There’s no adjustable damping, no Clio model is yet available with AEB, the climate set-up is single zone only, and the infotainment system is based around a smaller (7.0-inch) display and lacking Apple CarPlay (while Android Auto is part of an option pack). It otherwise matches the GTI’s features while adding some of its own welcome exclusive inclusions – such as LED headlights, front/rear sensors, heated side mirrors, and factory navigation. For Polo GTI buyers who prefer integrated guidance to using Apple or Google Maps via smartphone interfacing, it’s a $1900 spend for the Sound & Vision package that also switches the analogue instrument panel to a fancy digital display, expands the touchscreen display to 9.2 inches, and swaps the elementary audio for a 300-watt Beats system. Our GTI test car featured every option package available. The $1400 Driver Assistance groups adaptive cruise control, blind-spot detection, rear cross-traffic warning, and auto-steering parking assistance. A $3900 Luxury package brings microfleece upholstery, front seats with heating function, LED headlights and daytime running lights, panoramic sunroof, darkened rear-side and rear windows, and 18-inch ‘Brescia’ alloy wheels. Fully brimmed, our test GTI costs $38,490 before on-road costs – or money that could get you into a Golf GTI Original if you don’t mind a three-door body style. No wonder the Original disappears with the significantly pricier MY19 Golf GTI due soon (though dealers are still likely to have stock for some time). Our RS Sport test car’s cost was also fattened up, from $30,990 to $34,740 before extra charges. A $1500 Entertainment Pack introduces Bose audio, telemetry display (RS Monitor), and exchanges the default media system for an R-Link multimedia set-up. And another $1500 pack – Luxury – brings leather-Alcantara seats with heating function for the fronts, and a height-adjustable front passenger seat. For buyers looking to step up the sportiness, the $32,490 RS Cup is equipped with bigger wheels and a ‘Cup’ chassis with even stiffer springs and dampers. A manual gearbox seems a natural transmission to provide at this more price-sensitive end of the hot-hatch spectrum. Disappointingly, neither the GTI nor RS offers one; it’s a dual-clutch auto or nothing. Volkswagen’s six-speed DSG unit is paired to the biggest engine yet for the Polo GTI. After two 1.8-litre turbos sandwiching a 1.4-litre ‘Twincharger’ across previous iterations, the baby Gran Turismo Injection uses the ubiquitous EA888 2.0-litre four-cylinder turbo related to the motors found in the performance Golfs (GTI and R). It’s a lower-spec version for the smaller VW, of course, though while 147kW seems to have become the default power output for the segment, the GTI’s 320Nm is a benchmark torque figure. However, class-leading acceleration, at least in terms of the standing-start sprint, is set to belong to the new Fiesta ST.
A 75kg-heavier kerb weight means the 1355kg Polo GTI doesn’t better its predecessor’s 6.7-second mark, leaving it two-tenths shy of the Ford’s quoted time – though on par with the RS Sport. In-gear performance is a greater highlight. With that maximum torque delivered between 1500 and 4350rpm, the Polo’s bulbous mid-range provides especially strong and elastic response in third gear, while still pulling impressively in higher gears. That’s helpful as the DSG, despite being installed in a sportier VW, is calibrated to shift fairly early into higher gears for the sake of fuel economy. Yet, the gearbox is also smart enough to make a subtle downshift when a flat road starts to turn into an incline, or if the driver gives the accelerator pedal a small prod. It ensures good throttle response in the GTI’s Normal mode for regular driving, while a Sport mode sharpens it as part of a more aggressive drivetrain setting. Sport introduces more burps and crackles from the exhaust, though they’re still too polite. Combined with a power delivery that’s impressively linear but adds little drama, the GTI’s 2.0-litre could be accused of being a bit too refined for its own good. It’s certainly over-protected by an auto that upshifts ahead of the engine’s redline, even if you have the Sport mode selected and are using the paddles. The Clio RS was once powered by a wonderfully charismatic, normally aspirated 2.0-litre before switching to a turbocharged 1.6-litre in 2014. With the GTI now in play, the entry-level RS would ideally have the higher-tune, 162kW/280Nm unit found in the limited-edition RS18 variant (and previously Trophy). The Sport’s 147kW has power parity here, but its 260Nm looks undernourished in comparison. Yet, while there’s undoubtedly a stronger mid-range urge to be discovered in the GTI that can take some corners one gear higher, the Clio RS feels plenty quick – benefitting from a significantly lower mass: 1205kg. With the RS Drive button engaged, the French hatch’s relatively energetic performance is accompanied by enjoyable gurgling and whooshes, even if the noises owe more to sound engineers – enhanced via the audio speakers – rather than car engineers working on intake and exhaust plumbing. And more so than in the VW, you’re almost willed by the engine’s enthusiasm to target the redline. It’s a pity the paddle-shift levers aren’t as perfectly positioned as they are in the Volkswagen. Attached to the steering column rather than wheel, and placed too high, RS drivers are forced to lift their fingers inconveniently upwards to flick a paddle. It prompted this driver to instead use the tip-shift function of the auto gear lever. Or you could just leave the auto to do the shifting as it’s hugely effective in RS Drive mode – ensuring there’s lively throttle response and aggressive downshifts under heavy braking. We just advise its use for sportier driving. Around town, the accelerator pedal is otherwise too toey and the auto a bit too busy. And even in its regular setting, the Renault’s EDC dual-clutch can be clunkier than the Polo’s DSG version that is mostly free of the low-speed irks that have plagued the gearbox’s history. Both test cars made sounds that would have had us returning them to the dealer for fixing. The GTI’s dash rattled loudly when the engine was being revved out; the RS’s instrument panel buzzed intermittently. Experience of previous RS models and two GTIs driven at the launch event point to these being isolated issues. The new Polo GTI sits on the compact (AO) version of the MQB platform sitting beneath multiple VW Group models, including the Golf GTI. That means a torsion-beam rear suspension typical of its class (and like the Clio RS) instead of a multi-link arrangement. The GTI sits 15mm lower than regular Polos, while its springs, dampers and anti-roll bars have all been beefed up for sportier driving. So, it’s no surprise to discover the GTI rolls along with a noticeable firmness compared with a standard Polo. The damper tuning, though, ensures the general comfort level is more than acceptable around town. Even switching to the stiffer Sport doesn’t turn the GTI into an overly agitated nuisance, provided the surfacing isn’t too terrible. The RS, with underpinnings that are similarly intensified over a standard Clio, delivers a busier ride whether the road is urban or country environs, yet there are also absorptive qualities that allow for daily driving that isn’t overly taxing on occupants. Hot hatches, of course, are meant to compensate for any relative discomfort by providing some thrills on the open road. And in this respect, the Clio RS deviates little from the French-hot-hatch form book. It dives into bends with unbridled enthusiasm and responsive turn-in, and the alert chassis teams nicely with meatily weighted steering. RS Drive mode instructs the stability and traction-control electronics to delay their interventions, and grip from the 205/45R17 Goodyear Eagle F1 rubber is bountiful mid-corner – after which there’s impressive traction to be discovered if you bury the accelerator pedal for a rapid exit. The Renault, like the Volkswagen, employs an electronic system to enhance traction with subtle braking of the inside front wheel. Whether the RS’s system is more effective, or the GTI’s higher torque is actually counterproductive here, the Volkswagen loses some momentum accelerating hard out of bends – a temporary spike in revs is an audible pointer to the inside-front’s excessive rotations. The Polo’s stronger engine helps recover any time deficit between corners, though the Polo GTI is ultimately not as rewarding as the RS on drivers’ roads. Weighing a hefty 151kg more than its French rival, the German five-door is not as twinkle-toed in quick directional changes – circumstances where the GTI’s optional front seats prove to be less effective at holding torsos in place compared to the RS’s heavily bolstered (extra-cost) huggers. The GTI’s brakes are also a touch wooden on initial application, and then less consistent throughout the pedal travel under extremely hard slowing. Although the GTI’s chassis is not as tuned in with its driver as the RS’s, the Polo is not devoid of enjoyment. The brakes are plenty powerful, and the neutral on-limit handling allows the GTI’s potent mid-range pace to be exploited with great confidence. Its steering, as with the RS’s, is also impressively free of torque steer. The world of car interiors is changing rapidly, even in the city car segment, especially with regard to infotainment and connectivity. So, it’s inevitable the Clio’s R-Link system, which looked trendy when first introduced in 2013 on the Clio, looks somewhat dated in size and presentation – especially in the company of the Polo’s suave-looking glass touchscreen. R-Link isn’t standard on the Clio RS, though the base system still has navigation. The GTI needs the optional 9.2-inch Discover Media system for integrated guidance, though smartphone integration (App Connect) is standard. The higher-spec infotainment system is a tempting option box to tick on the GTI, as the package also brings the Beats audio (which sounds as fabulous as the Clio’s Bose system) and VW’s cool, high-tech Active Info Display digital instrument cluster. However, those three key features are all standard on the cheaper Polo Beats. Thus equipped, no city car can match the Polo’s dashboard sophistication, while the Renault can’t match the VW’s optional driver aids. Being mindful these are hot hatches, the Clio RS looks the sportiest inside. The RS logo adorns the steering wheel and headrests, there are red seatbelts, red faux metal on the gear lever, red stitching galore, and those chunky (optional) sports seats. A bold expanse of red plastic is plastered across the Polo GTI’s dash, with the colourful trim also applied to the centre stack/console surround and doors. It may not be to everyone’s taste and there are no alternatives, though at least – as with the Polo Beats that gets an orange version – it ensures your GTI interior won’t be confused with the rather austere cabin of the Polo 85TSI. A GTI cabin somehow feels incomplete without the signature tartan cloth seats and the optional microfleece upholstery looks less interesting, if unquestionably comfortable. The newer Polo doesn’t claim the expected advantage in materials quality. The GTI features as many hard plastics as a base model, while the Clio’s interior – which has aged better than its infotainment system – benefitted from an upgrade to materials in 2017. Its door trim, for example, looks and feels more expensive than the Polo’s. Storage options are more limited in the Clio, though, and passengers will prefer the Polo’s rear seat: it has more head room and knee space, even if the Renault is far from cramped. It’s the Volkswagen again for best boot space. Factory warranties are identical – and equally disappointing. Volkswagen is sticking stubbornly to three years despite the majority of manufacturers offering five years now. Renault had been offering five years on its models, but in mid 2018 declared its RS models would revert to three years. Is the French brand suggesting its sportier models are less reliable? Renault Australia opts for three years again for capped-price servicing – making it one of the shortest programs in Australia. At least servicing costs are reasonable at $369 a pop, and the company allows longer mileage between dealer visits: 20,000km versus Volkswagen’s 15,000km. Comparing three-year servicing costs, the Clio RS will set you back at least $1107 (there are some periodical extra charges for filters and spark plugs) compared with a $1447 maximum for the Polo GTI. There’s a scary $1374 fourth service for the Polo GTI, mind you. Volkswagen offers free roadside assistance for the warranty period. Renault’s is also complimentary up to four years – provided owners stick to the annual service program with an authorised dealer. The ‘affordable performance car’ label is harder to stick to the Volkswagen Polo GTI once you start loading up tempting options, while ideally buyers could opt for the 18-inch wheels without losing the tartan seats. For the Clio RS, we’d like to see Renault slotting the higher-tune 1.6-litre turbo from the RS LE into the Sport, while we still lament the absence of a stick-shift option (especially as the paddles are ergonomically flawed). The Sport could also be standard with the R-Link infotainment system and RS Monitor telemetry. Yet, while both models leave the door ajar for the Fiesta ST to claim potential class leadership in 2019, the wait may be meaningless for practicality-focused buyers if Ford doesn’t confirm the five-door variant. And the Renault and Volkswagen are strong options. The latest Polo GTI comes the closest yet to miniaturising the Golf GTI experience with a compelling, all-round package. It delivers versatile performance, a ride that’s firm but sufficiently comfortable for everyday motoring, and a greater array of contemporary technology. Our fond memories of the endearingly brilliant last-generation Clio RS still haven’t faded, though the fourth-generation Clio’s chassis is no betrayal of Renault Sport’s lineage. Agile and adjustable, it’s engineered to entertain in tandem with its feistier drivetrain – and imbued with sufficient comfort for the daily drive without the need for more than one suspension setting. Essentially, Polo GTI versus Clio RS boils down to what you want from a hot hatch. Do you want the Volkswagen with its extra space, refinement, technology and muscle, or do you prefer the Renault and its sportier handling and drivetrain?